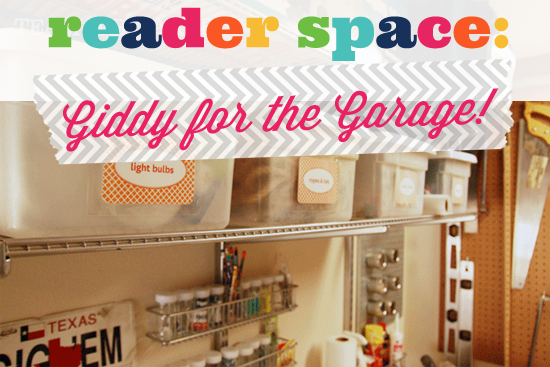 IHeart Organizing: Reader Space: Giddy for the Garage! 27 Reader Space: Giddy for the Garage! Now that spring has sprung, our garage needs love and attention. I avoid it all winter long since I find it far too cold to clean, but oddly find joy in sprucing it up when it gets warm outside. So Kathryn's newly organized garage couldn't have come at a better time. Talk about the inspirational push one needs to take back their garage! Kathryn said something that really hit home to me.... "People make a huge investment in the vehicles they drive, yet park them outside to store inexpensive 'things' inside of the garage." So true right? Why do we do that? Time to take back our parking spots and protect those investments! I had to know more details about this incredibly organized space. Oh, and did I mention, Kathryn is a mom of five? 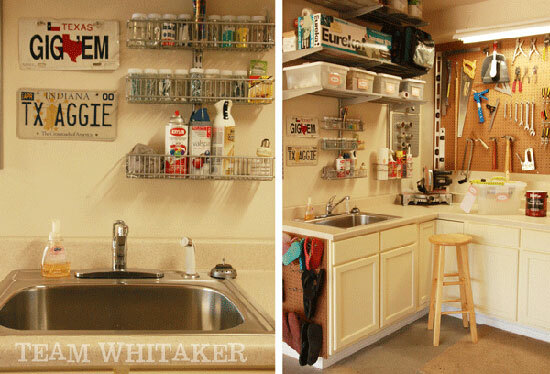 Kudos to her for giving her family a great place to store all of the goodies for work and lots and lots of play! "First and foremost, we like to park our two vehicles in the garage! It seems silly to park a $30,000+ investment outside and store significantly less than that in the garage. The garage space is hardworking, as it stores our tools, cleaning equipment, craft supplies, sporting equipment and ladders/chairs. 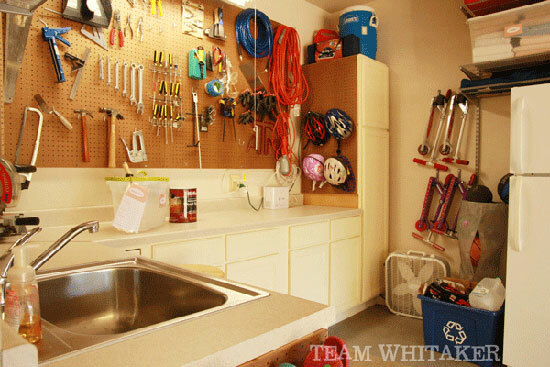 Besides the kitchen, it's the most-used space in our home since every project begins in the garage!" 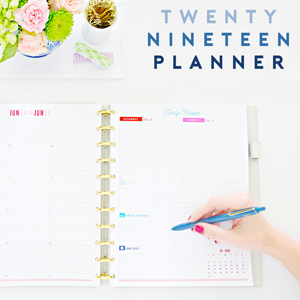 Do you have any superstar tips for keeping it organized? "Involve your kids! We have five children and even if I was Wonder Woman, there's no way I could clean up after them all the time. About one-third of what's stored in the garage is theirs and we're teaching them how to be good stewards of those things. If a ball gets ruined because it was left out in the rain, they quickly learn to put it up the next time! 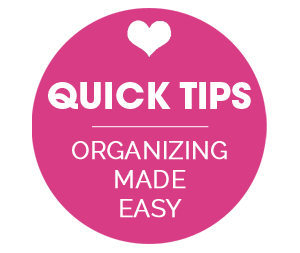 Periodically, do a quick clean-out of unused, broken or unnecessary items. We usually do ours in the spring and fall before and after Texas hits triple digits! It reminds us of what needs to be used, recycled or thrown out. Austin has a great paint recycling program that we utilized when we recycled more than 20 gallons of old paint cans. Be honest with yourself. Why are you really keeping something? The space had become a dumping ground for every random thing we owned. Think up; think vertical. In every instance, we employed both and we now have our garage floor back." "Pegboard, plastic bins and hooks of all shapes and sizes. We creatively used pegboard and hooks for shoe storage and bicycle helmets. I love it because it's inexpensive and versatile. 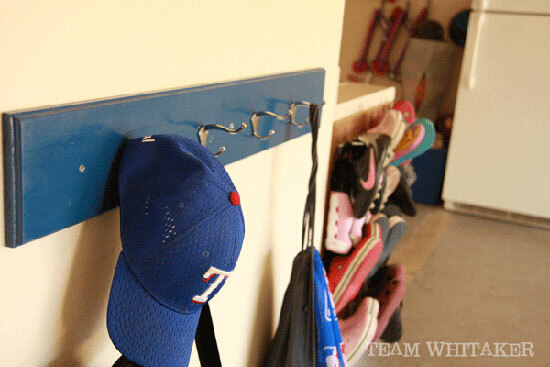 The hooks are used throughout the garage - on the wall for ladders/chairs and as part of a hanging system for gym bags and hats. Of course, the clear plastic bins keep dust out, but allow us to see what's inside." "In an effort to honor my husband's request and not make it a "sissy garage," I used fun labels in key spaces and painted the cabinets. I used label templates from BHG and they got the stamp of approval from my better half. By laminating them and affixing to boxes with velcro, it gives us the ability to switch them out when our needs change (hat tip to Jen for that idea!). The paint labeling project was fun, too. 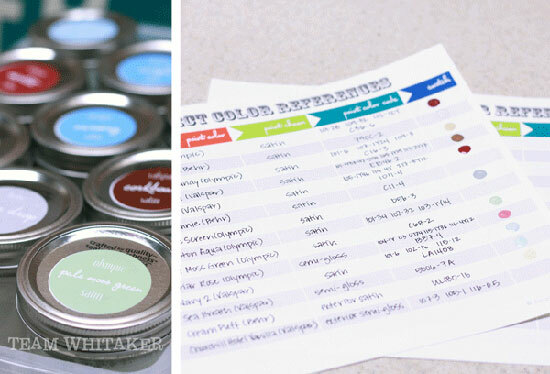 I used Jen's paint organization idea, making labels for the touch-up jars and for our bigger paint cans we kept on hand, using simple round labels from the office store. While it's a space that's primarily used by the man of the house, I wanted it to be a space in which we were all a part of creating." "The cabinets, countertop and shelving weren't cheap, but we made them affordable by leveling, installing and painting it all ourselves. We found the countertop on clearance and we purchased the shelving on sale. Every little bit helps. I made all the labels, we got creative with plastic bins we shopped from our house and used pegboard in place of expensive bins. 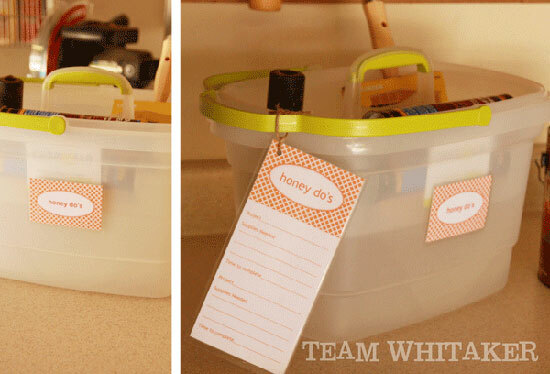 I even made a "honey-do" bucket that contains the supplies needed and a laminated checklist of all the projects on the list. It was an added bonus to get the refrigerator from a former neighbor who was moving and couldn't take it with him!" "Every time I drive into the garage, I smile. That has to be worth it right there! The kids were a big part of cleaning out the space, helping us sort through things and they've taken real ownership in keeping it that way. It's made projects go so much smoother because we know where things are stored." So so great right? I am a believer that the garage is an extension of the home, yet often times it is one of the most neglected. I am guilty of that myself, but seeing this space being used and loved by Kathryn's family, really gives me the push to take back our outdoor space. Kudos to Kathryn for getting her kids involved in the process. I am a believer that kids take more pride in maintaining systems when they understand the organizing process. I appreciate her ability to be ruthless and only keep what they use and need, purging is a great feeling! Love the pegboard system. It's inexpensive, and really utilizes wall space. It keeps everything on display so things are quick to find, and simple to return. I have never thought to hang shoes on pegboard, but I have to say, it's quite genius! Peg board shoe rack! 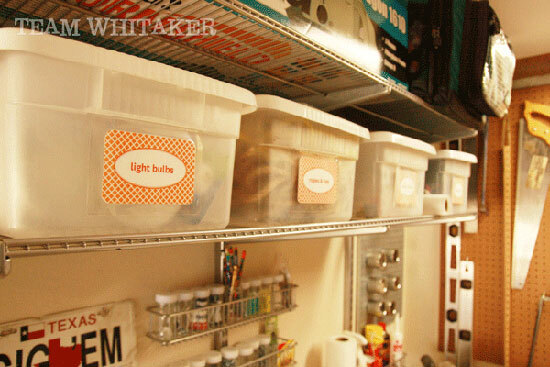 The walls are lined with different organization tools and systems based on the supplies being stored. Brooms, ladders and fishing poles all have a home up off of the ground. 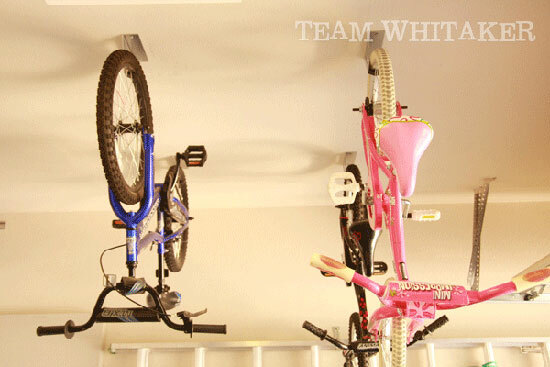 Hanging bikes from the ceiling is another great space saving tip. We do this too, and it's been working wonders for years. I adore that they installed cabinets and counters to give themselves a solid place to build, craft and project. They took it a step further by painting the cabinets white, which really brightens up the garage. They also added a sink and now they have a place for cleaning paint brushes and other dirty kid messes, saving their kitchen sink for dishes. Labels make everything better right? They are so pretty, even in a garage! Love them. And bonus points for laminating them, the garage is a dusty dirty place, laminating her labels will ensure they will be around for years to come. What's not to love about that paint storage? Gets me every. single. time. Now it's your turn. What are you loving about this super fantastic space? Anyone else taking their garage back after a long winter? You can find more details and photos about Kathryn's entire garage project on her blog here. Wow, that's amazing! There are so many awesome ideas here. Well done, Kathryn! I so want an organized garage. Unfortunately we have very limited storage in the house, so everything ends up in the garage. We used to get one car in, then we remodeled the kitchen, got new flooring, kids grew up,and eventually car got kicked out! I have tried to organize better. We have overhead storage that holds Christmas, then bins everywhere. Was starting to make a dent then DD moved back home from college, she is commuting now. So 5 more bins added, oy, makes me sad. I think it would take a month to redo! DH would just toss everything, but can't really do that. I will have to keep working on it. You are an inspiration. Thanks. 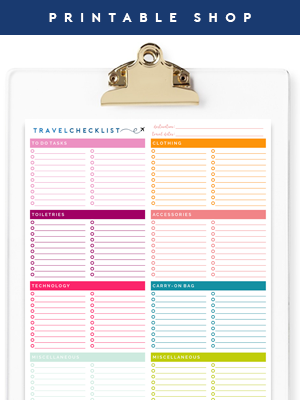 You had me at the Honey Do Bucket and List - what a great idea! I am amazed that they park two cars in the garage and have five kids! Awesome space!!! Love all of it. I need to implement that pegboard in my garage! This is just straight awesome! I love all the creative storage and how she maximized all that vertical space. 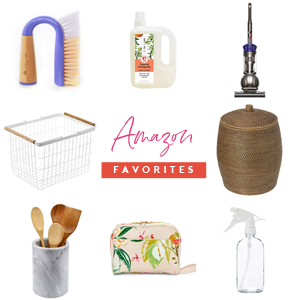 The timing was perfect for this - the garage is on our spring cleaning list for this weekend :) Thanks for the great ideas and kick in the pants, Kathryn!! Every time I pull into my garage I think 'this place needs help.' Thank you for sharing some great ideas! I will definitely put some of them to good use. I want to know more about the "honey dos"!!! Jen, thank you so much for the feature! It was dirty work cleaning out the space, but we are loving how pretty it is, even though it's a space that works hard. And, thanks to all y'all for such kind words. The 'honey-do' bucket really is my favorite part! I just finished adding more organized storage to our garage - a cubby of sorts for baseball gear and outside shoes that we built ourselves with leftover mdf from my coat closet redo. We have great metal storage shelves (IKEA BRUDER from about 5 years ago) that we brought with us when we sold our last house(nope didn't leave them behind since we just installed them) ;) That hold camping gear and other outside type stuff. So now that I have the sports corner organized it's time to redo the garden tools that keep falling off the rack : / Of course now I am dreaming of paint colors since we haven't painted the drywall yet. It's coming together slowly over three years. 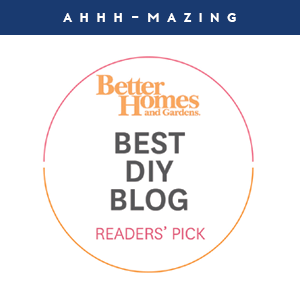 I have you and some other blogs to thank for giving me the ideas and encouragement to make my house organized and pretty. Thanks Jen! I just did this! It took me 5 months but now weve donated or sold every item on craigslist that we no longer use or need. it feels AWESOME to be able to park both cars in there and still have lots of room for holiday decorations and the kid's toys. I'll agree, investing in matching bins and labeling is KEY! it makes for a clean space. Love this post! Even picked up a few more tips! I love, LOVE the cabinets, counter and SINK!!!!!!!!!!! Awesome! Amazing this organization! I will try to do it when we change our flat! I love the pegboards... What kind of hooks are used to hold up the shoes? We just used regular hooks, from the tool organization section at the home improvement store. Some were single and some double. I'm extremely jealous of the sink--that's genius! For those who hang their bikes--do you hang them back up every time your kids are finished riding, or do you keep them down in the summer? Just wanted to say Howdy to a fellow Texas Aggie! Gig 'em & Whoop!!!! Lovely, especially the part about having a good clear out and getting rid of stuff you don't need. Great idea to hang the bikes and scooters up, but isn't it a pain having to get them down every time the children want them? The scooters are within kid reach and they can get them down easily. The bikes are a little heavier. The only bike I can't manage on my own is my oldest's bike (he's 12). So far, it hasn't been a problem and they've been on the ceiling for about two years. Oooh I never thought a garage could look so pretty! I love the attention to detail with all of the labels and lists. I think part of the problem in a garage is that people lose track of what they have in there because so much is stored in one place--that definitely won't happen with this wonderful system! Thanks so much for sharing, Jen and Kathryn! 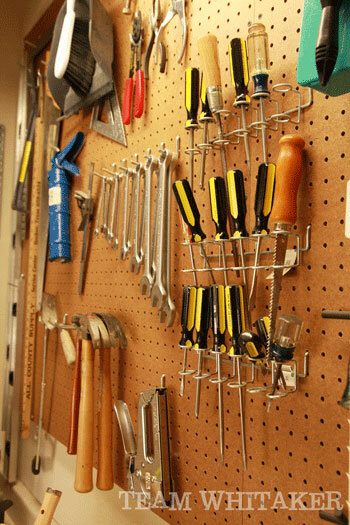 This really inspired me to work on my own garage this weekend and as we try to organize all of our tools, I am wondering what tools do you find you use the most in all of your DIY projects? What do you find are the essentials and what are "nice to have." We aren't super handy, but we are trying to learn to do more things. We've inherited a bunch of tools and I'm trying to figure out what we really need to keep and what we can let go of. Great post topic idea! I have added it to my list. I will chat with the hubby and see if we can get a list put together. Love the idea!